Welcome to Apple Week here on Just Another Day in Paradise. All week long I am going to be sharing some apple goodness. It really isn't a secret that I love Fall. One of my favorite things to do in the Fall is pick apples. The last few years we have not picked apples. Say what?!? When we lived in Ohio, we had an orchard we went to every year. Without fail, I tell you. We loaded the kids in the Mini and headed out ready to pick a trunk full of honeycrisp apples (those are our very favorite). We may have eaten our fair share fresh off the tree as well. I love seeing my Little Men's squishy faces all covered with fresh apple due to scarfing down of one apple after another. The last two Falls have been a little less spectacular in the absence of apple picking. Good news is this year Fall gets to be just as spectacular as is used to be. Technically, we picked, and we picked again, and we picked some more. I currently have a kitchen full of apples. I have been canning, baking, cooking, and projecting it up. Hence the fruition (hehehe...fruit...apples are fruit...is it not funny if I have to explain it?) of Apple Week. Let the apple wonderfulness begin!! Huzzah! I am kind of geeking out about what I am sharing with you guys today. 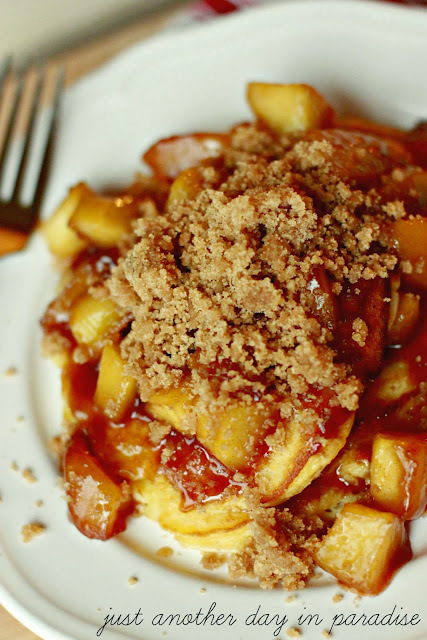 One of my favorite apple desserts is Dutch Apple Pie. Kind of love it. Love it a whole lot. So that is what I did. I made myself a glorious plate of Dutch Apple Pie Pancakes. So good. Well hello morning, it is nice to see you. Thanks for bringing your friend along. 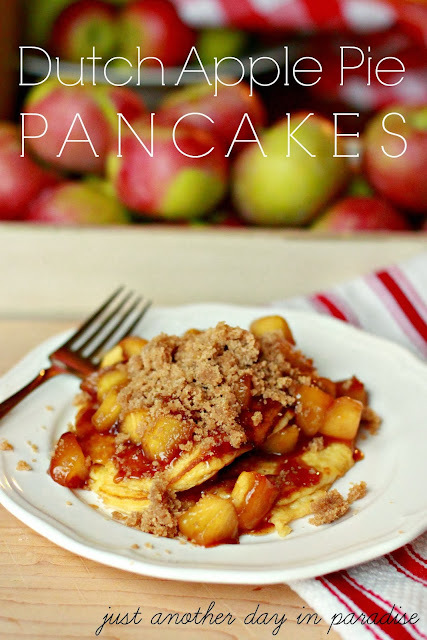 Any Fall leisurely morning should really be started by the devouring of these pancakes. Just a friendly suggestion, but I am pretty sure you will thank me. All those gathered round your breakfast table will thank me. No, no, don't send a thank you note...that is just silly. I mean, it is thanks enough that you stuff your face happily with these pancakes. First, prepare the crumb mixture, by combining the brown sugar, flour, and cinnamon in a bowl. Cut in the softened butter until the mixture resembles coarse meal. Set aside. Next saute the apples by placing the butter in a sauce pan and melt on medium heat. When the butter melts, add in the apples and stir. Turn the heat to low, cover, and cooker for 10 minutes. After 10 minutes, add the sugar and cinnamon and raise the temperature to medium heat. Cook, stirring frequently, until the apples are tender and glazed, about another 10 minutes. Turn off heat and set aside. To make the pancakes, place the sour cream, flour, sugar, baking soda, and salt in a bowl. Stir gently. Mix until just combined. In a small bowl, whisk the eggs. Then add the vanilla to the eggs. Pour the egg mixture into the sour cream mixture. Stir gently until combined. Melt the butter on a hot skillet. Pour a little less then 1/4 cup of batter on the skillet at a time. Cook each pancake for about a 1 1/2 minutes, until there are bubbles on the surface of the pancake. Flip an cook the other side for less than a minute. Until done. Lay one pancake down on a plate. Spoon a little bit of the apple mixture down. Lay another pancake on top of the apple mixture. Then top with more apple mixture and a generous handful of the crumb topping. Come back tomorrow for more apple goodness. I so totally love when a breakfast is so amazing that it screams, brunch or invite friends over for General Conference! Of course this is saying eat me anytime!